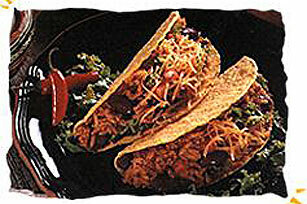 Ground chicken, rice and beans fill these hearty tasty tacos. Let everyone top their own taco with lettuce, tomatoes and cheese. Melt butter in large skillet on medium-high heat. Add chicken and onions; cook until chicken is cooked through, stirring frequently. Stir in taco seasoning mix, water and tomato sauce. Bring to boil. Reduce heat to low; cover. Simmer 5 min. Add rice and beans; mix well. Cover. Remove from heat. Let stand 5 min. Fill taco shells evenly with the chicken mixture; top with cheese, lettuce and tomatoes. You can't help saying "Viva Mexico!" when you enjoy a portion of this food on occasion. Substitute ground turkey for the ground chicken. Makes 8 servings, 2 tacos each.